Are you one of the applicants who are in search of SSC CPO Paper I Admit Card 2018-2019. Then you are at the correct place to get the details about the SSC CPO SI, ASI Hall Ticket 2018-2019. The SSC organization will release the SSC CPO Paper I Call Letter 2018-2019 soon on its official web portal. In addition to this, we have provided the SSC CPO Paper I Exam Pattern, Selection Process 2018-2019 and steps to download the SSC CPO Paper I Admit card 2018-2019 in the below sections. And, the SSC CPO Paper I SI Admit Card 2018-2019 will be released in the month of May 2018. 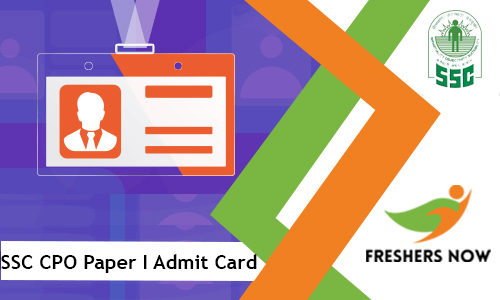 Moreover, we have gathered all the details related to the SSC CPO Paper I SI Admit Card 2018-2019 in this article. The applicants who had submitted their registration forms need to download the SSC CPO Paper I Admit Card 2018-2019. Moreover, contenders need to enter the information like application number and date of birth to get the SSC CPO Paper I Call Letter 2018-2019. For the sake of competitors, we have given the direct link on this page to download the SSC CPO SI, ASI Hall Ticket 2018-2019. Therefore, the aspirants need to wait few more months for the SSC CPO SI, ASI Admit Card 2018-2019. For more updates, applicants can visit this page frequently. The more particulars about the SSC CPO Paper I Admit Card 2018-2019 are provided in the below table. Therefore, applicants can get an overview of the SSC CPO SI, ASI Call Letter 2018-2019 by referring the table. 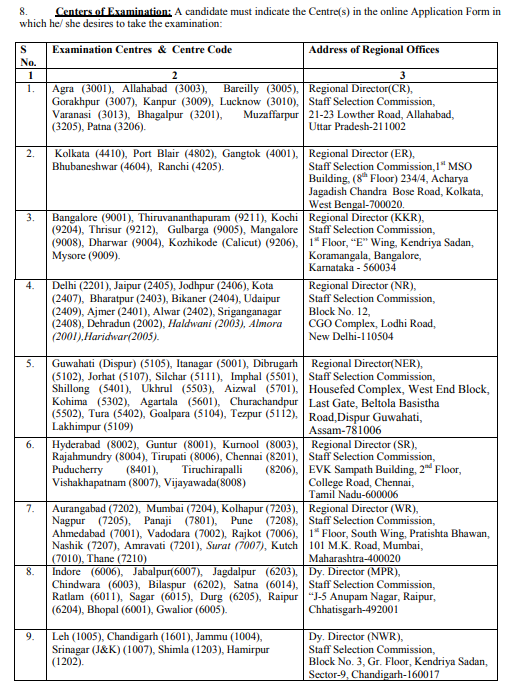 The Staff Selection Commission / Central Police Organization has issued a notification for the SI, ASI positions of 1223 vacancies. The recruitment process has started a few days back and will be closed on April 02nd 2018. So, the interested and eligible aspirants need to register fastly. Moreover, we have provided the link in this article for the SSC CPO Recruitment 2018-2019 details. By clicking on the link contenders can register for the SSC CPO Recruitment 2018-2019. The SSC organization is planning to held the exam on 04th June to 10th June 2018. Therefore, applicants need to get the SSC CPO Paper I Admit Card 2018-2019 before going to the examination. The SSC CPO SI, ASI Hall Ticket 2018-2019 is the important document to participate in the written examination. Without fail, the candidates need to download the SSC CPO Paper I Hall Ticket 2018-2019. On our website, we have arranged the SSC CPO Paper I Syllabus 2018-2019 and SSC CPO Paper I Previous Papers. So, candidates can start their preparation based on the given stuff. Nowadays many of the applicants are very interested to apply for the police recruitment. Therefore, the competition levels are very high for the written test. By the time a huge number of competitors are registered for the SSC CPO Recruitment 2018-2019. Moreover, the examination dates are also announced by the authorities. So, the candidates need to prepare well for the examination. Contenders can scroll down this page to know the more details about the SSC CPO Paper I Admit Card 2018-2019. Many of the contenders are eagerly waiting for the SSC CPO Paper I Exam Pattern 2018-2019. Therefore, to clear all the doubts of the aspirants we have provided the exam pattern in this section. And, candidates need to complete the exam within the given time. The time duration for Paper I is 2 hours. The selection process for the SSC CPO Recruitment 2018-2019 includes four rounds. At first, the applied aspirants need to participate in the Paper I examination. And, the candidates who qualified in the Paper I test need to face Physical Standard Test (PST)/ Physical Endurance Test (PET). Then the organization will organize the Paper II exam followed by the Detailed Medical Examination (DME). So, the competitors need to participate well in all the rounds of selection. The SSC CPO Paper I Admit Card 2018-2019 will contain the information which is provided below in this section. If anyone of the information is found as a mistake on the SSC CPO SI, ASI Hall Ticket 2018-2019 applicants need to inform the SSC organization. Contenders need to carry some mandatory documents to the examination hall along with the SSC CPO Paper I Admit Card 2018-2019. Moreover, the applicants need to cross check all the details which are printed on the SSC CPO Paper I Call Letter 2018-2019. The documents need to carry to the test center are PAN Card, Aadhar Card, Voter ID, College Identification, Driving License or any other proof issued by the government. Moreover, the steps to download the SSC CPO Paper I Hall Ticket 2018-2019 are given in the below section. For updated information visit freshersnow.com. So, aspirants can check our website on daily basis for the current information.